Paul Rabil’s five-point game (four goals, one assist) propelled the New York Lizards to a 14-12 victory over the Rochester Rattlers on Sunday afternoon at James M. Shuart Stadium. Rabil, a seven-time Major League Lacrosse (MLL) All-Star, had arguably his finest game as a Lizard, mixing crisp passing with fancy footwork and smart shot selection. Rabil was nearly unstoppable, but Rob Pannell (three goals, one assist), Matt Gibson (two goals, one assist) and Matt Poskay (two goals) were also key contributors on offense. After being dominated by the Rattlers for the past two years, the Lizards turned the momentum back in their favor with a sweep of the 2015 season series. New York, which was coming off a win over Rochester in Week Two, now sits atop the Major League Lacrosse (MLL) standings with a 3-0 record. The Lizards opened a 5-2 lead by the end of the first quarter, with scores by Mike Stone, Rabil, Poskay and two from Pannell. 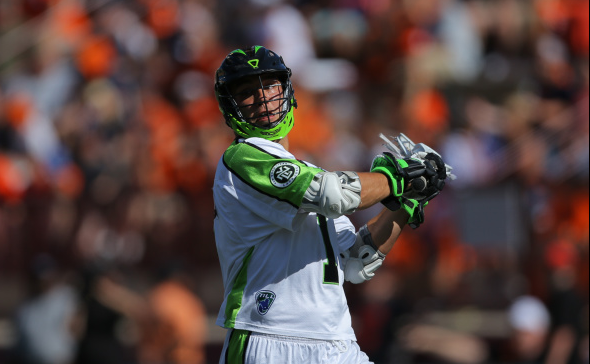 Rabil, a seven-time MLL All-Star, highlighted the opening stanza with a goal from long-range in the tenth minute. Pannell and Gibson scored two minutes apart in the early-going of the second, providing the Lizards a seven-point advantage with 10:06 to go before halftime. New York opened an 8-2 lead in the 26th minute, as Rabil found the back of the net for his second goal of the game and sixth of the season. Drew Adams had three saves in the first 30 minutes to send the Lizards into halftime with an 8-3 advantage. Rochester rallied back in the third quarter, cutting New York’s lead to four on a goal from Ty Thompson with 10:20 to go before the final frame. The Rattlers (1-2) certainly made things interesting with their high-octane offense, but Poskay kept New York on top with a goal at the 7:15-mark of the third. Poskay’s tally put New York up 9-4, and they never looked back. A two-pointer from Kyle Denhoff cut New York’s lead to 9-7 with 3:47 left in the third. However, ferocious defense from Brian Spallina, Steve Holmes and Joe Fletcher had the Lizards feeling cool, calm and collected heading into the fourth quarter. Rabil connected on a goal — his third of the game and seventh of the season — with less than three minutes left on the clock in the third, to send the Lizards into the final stanza with a comfortable three-point lead. Gibson and Tommy Palasek effectively iced the game for New York, scoring 58 seconds apart in the early part of the fourth quarter, to open a 12-8 Lizards lead. Rabil kept the pressure on in the waning minutes of the game, scoring with 5:35 left on the clock to keep New York ahead by two. Adams wrapped up the game with seven saves. The Lizards ship up to Boston next weekend for the first part of a home-and-home series against Rabil’s former team, the Boston Cannons. The game, which emanates May 3rd from Gillette Stadium in Foxborough, Mass., will be Rabil’s first opportunity to play against the Cannons since his trade to New York in the offseason. The Lizards return home May 8th at 7:30pm, and the first 1,000 fans in attendance will receive a New York Lizards foam finger. To purchase tickets, call 1-855-NYLizards or visit NYLizards.com/tickets.